Mahindra’s new Fortuner rival, the Alturas G4, will launch in India on November 24. While the Alturas G4 is a new moniker, the SUV is a rebadged version of the new-gen Ssangyong Rexton (Y400). The Alturas G4 is longer, wider and has a larger wheelbase than its predecessor, the Ssangyong Rexton. First things first, the Mahindra Alturas G4 is a new moniker. However, the new SUV is identical to the Ssangyong Rexton Y400 and has only been dubbed ‘Alturas G4’ for the Indian market. 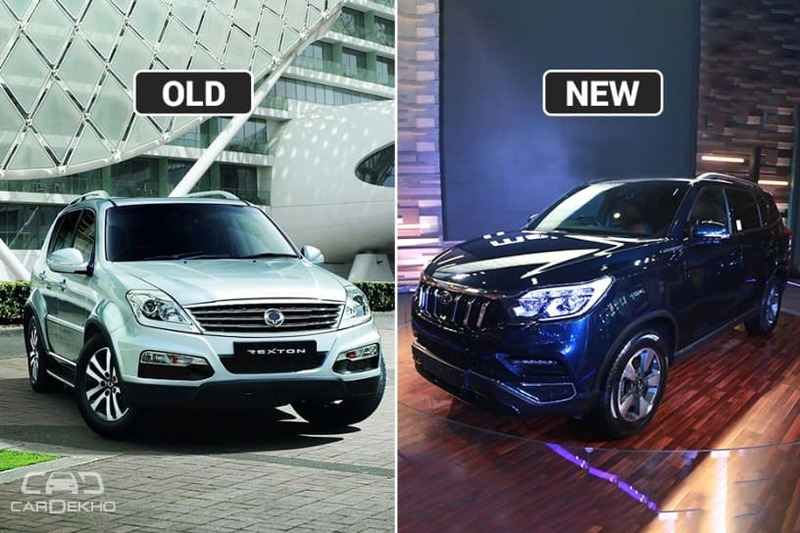 Therefore, we are going to compare the new Alturas G4 to the previous generation Ssangyong Rexton. Comparing the design, the Alturas G4 features a sharper styling compared to its predecessor. The front grille features vertical chrome slats compared to the horizontal slats present on the Rexton. The headlamps are horizontally stacked on the Alturas G4 compared to the vertically stacked headlamps of the Rexton. The fog light housing on both cars have a horizontal orientation, however, the Alturas G4 has slim LEDs instead of the regular bulbs in the Rexton W. The overall stance of the two cars is not very different, although the Alturas G4 looks more sporty due to its sharper design elements. The rear windshield is more raked on the Alturas G4 compared to its predecessor while the tail lamps are once again horizontally oriented, unlike the vertically stacked tail lamps of the Rexton. Comparing the dimensions, the Alturas G4 is longer(95mm), wider(60mm) and has a longer wheelbase(30mm) than the Rexton. The Rexton, though, had marginally more ground clearance and was taller than the Alturas G4 (that can be attributed to the higher roof rails of the Rexton W). The turning radius of the Alturas G4 is 20cm less than that of the Rexton. The increased dimensions of the Alturas G4 should translate into more space inside the cabin and a more comfortable experience for third-row passengers. The new Alturas G4 will get a new, downsized 2.2-litre diesel engine, compared to the 2.7-litre unit that was present on the Rexton. However, it still makes 16PS more power and 60Nm more torque and is BSVI-ready. While the Rexton was offered with a 5-speed MT and AT as well, the Alturas G4 will only be available with a 7-speed AT sourced from Mercedes-Benz. While Mahindra has not officially revealed the features list of the Alturas G4, we have a fair idea of what to expect. Firstly, the Rexton only had LED DRLs. The Alturas G4 will come with LED bits all around. That is the DRLs, headlamps (they will be projector units), fog lamps and tail lamps. Step inside and the 6.1-inch touchscreen unit on the Rexton has now morphed into an 8.0-inch unit that supports Apple CarPlay and Android Auto. The instrument panel an analog+digital affair on the Alturas G4 compared to the fully analog unit offered on the Rexton. Apart from this, expect a start/stop button, electric tailgate and a parking camera. On the safety front, the Alturas G4 will be kitted with nine airbags, compared to the four offered on the Rexton. These include shoulder airbags for the second row and a driver’s knee airbag. While the Rexton came with ESP, Active Rollover Protection and Hill Descent Control, the Alturas G4 will also get a Hill Hold feature. The Ssangyong Rexton was offered in two variants before being discontinued in 2016. Its prices then were Rs 24.25 lakh to Rs 25.99 lakh. As of now, the Alturas G4 has not been launched in India so we cannot compare its prices with the Rexton. However, expect the Alturas G4 to command a heavy premium (Rs 4 lakh-5 lakh) over the Rexton. The Alturas G4 will be launched in India on November 24.